N Korea leader 'appears in public' Jump to media player North Korean leader Kim Jong-un has made his first public appearance since 3 September, the country's official news agency says. Where is North Korea's Kim Jong-un? Jump to media player North Korean leader Kim Jong-un misses a key political anniversary ceremony, amid speculation over his absence from public view. Where is North Korea's Kim Jong-un? Jump to media player Kim Jong-un the supreme leader of North Korea failed to show up at a meeting of parliament. Rodman celebrates Kim Jong-un birthday Jump to media player US basketball star Dennis Rodman has sung Happy Birthday to North Korean leader Kim Jong-un in front of a crowd of thousands. Rodman's birthday song to Kim Jong-un Jump to media player The American basketball player, Dennis Rodman, who is on a controversial trip to North Korea, has sung "Happy Birthday" to the country's leader, Kim Jong-un. North Korean recalls prison escape Jump to media player A man who was born inside a North Korean labour camp and escaped in 2005 has been speaking about his experience. North Korean leader Kim Jong-un has made his first public appearance since 3 September, the country's official news agency says. 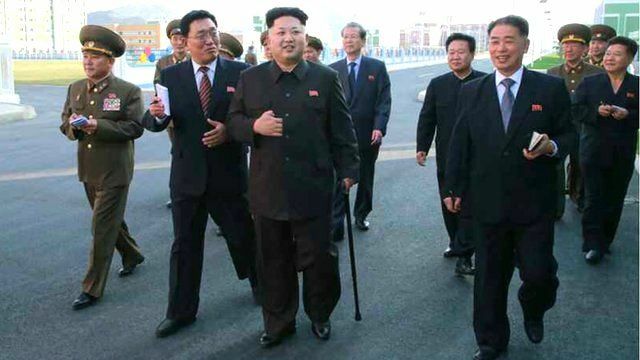 The KCNA agency said on Tuesday that Mr Kim "gave field guidance" at a newly built scientists' residential district. Stephen Evans reports from Seoul. Go to next video: Where is North Korea's Kim Jong-un?